After spending three nights at the Disneyland Hotel with my family, I rented a car and drove north. I spent a night at the Hyatt The Pike Long Beach by myself for some non-Disney relaxation. I love Disney and I love my family, but it was great to have some solo time before heading back home and to work. Hyatt The Pike Long Beach is one of the non-conformist properties; it is simply a “Hyatt”, and not a member of any of the Hyatt sub-brands (although many compare it to an Andaz). In this light it is similar to Hyatt Olive 8. 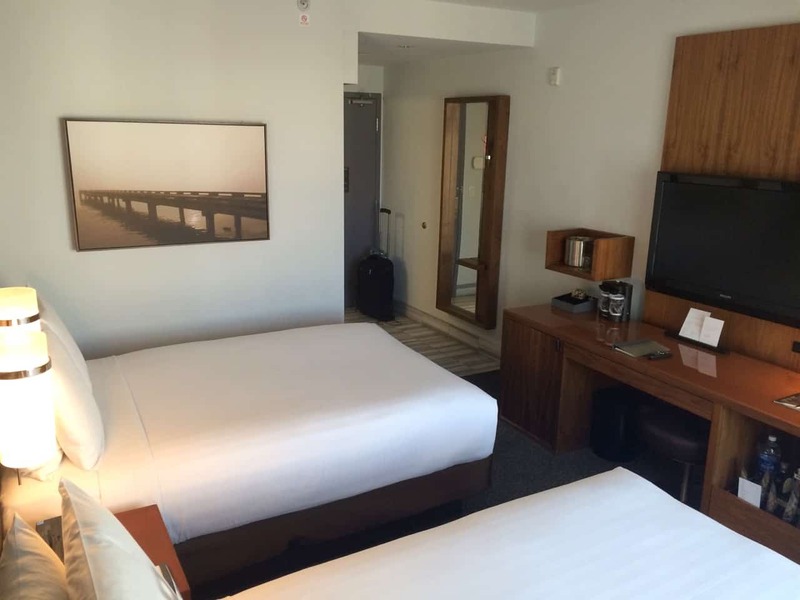 This is expected to change soon as Hyatt The Pike Long Beach gets rebranded as a Hyatt Centric when the new sub-brand launches this summer. Check In: I checked in at 4pm on a Saturday evening. It was quick, albeit a bit cold. I was given on the 7th floor which is the top floor in this property. I was a bit surprised to have two double beds as in my Hyatt Gold Passport account I list my preference as king rooms. I called the front desk and they explained that there were no king rooms available. Not a big deal, but my guess is that there are not many king rooms at this property which is a bit of a surprise considering that this property is not aimed at families. The lobby is modern and comfortable with various seating areas including two oversized rocking chairs. There is also a nice outside courtyard with a fireplace that, had I more time, I would have enjoyed. 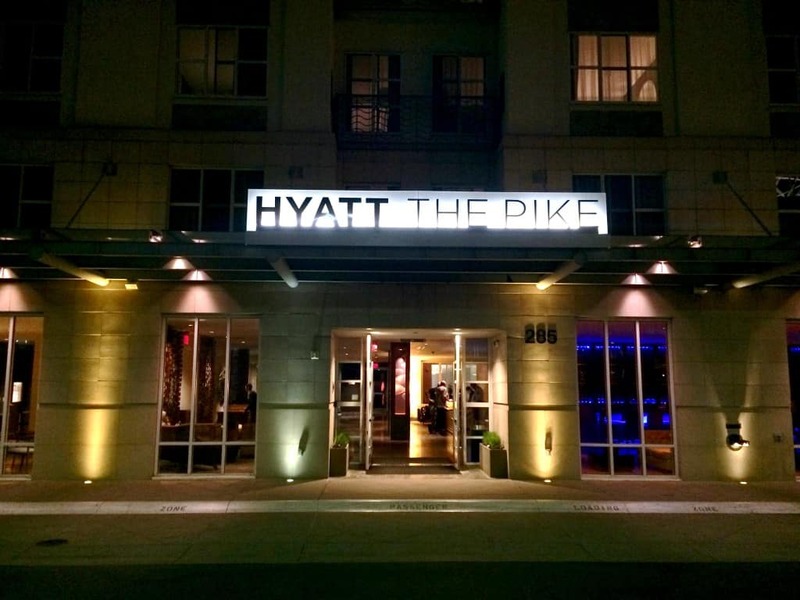 At night it was lit with strings of lights criss crossing the courtyard and a projected “Hyatt The Pike” logo on one wall. You do have to use your key to access the roof pool and any guest room floors. This is a nice security feature but it seemed everyone had problems remembering that you needed to insert your key; one time I rode the elevator with someone that missed their floor because they couldn’t get their key out in time. The hallways are very chic; dark colors and low lightening. The halls zig zag making the hotel feel more intimate and small. Room: The room itself was modern and bright, although small. I had a peekaboo view over the courtyard out to the water in the distant. At first I was disappointed to not be on an outside facing room, but realized that with the construction going on around the property, I had one of the quietest rooms. Since I had a double bed room, there was no seating except for a small pull out stool under the TV. Maybe a king room would have a chair or couch. There was a mini bar that had an empty shelf for personal items. There is a large A/C unit under the window; other reviews I have read complain that it is loud but I like white noise. The curtains were not black out and the room was quite bright as soon as the sun was up. The bed was very comfortable with high quality linens. There were plenty of accessible plugs next to the bed and under the television. Bathroom: The bathroom was small but elegant. It is definitely not luxurious but it is modern. 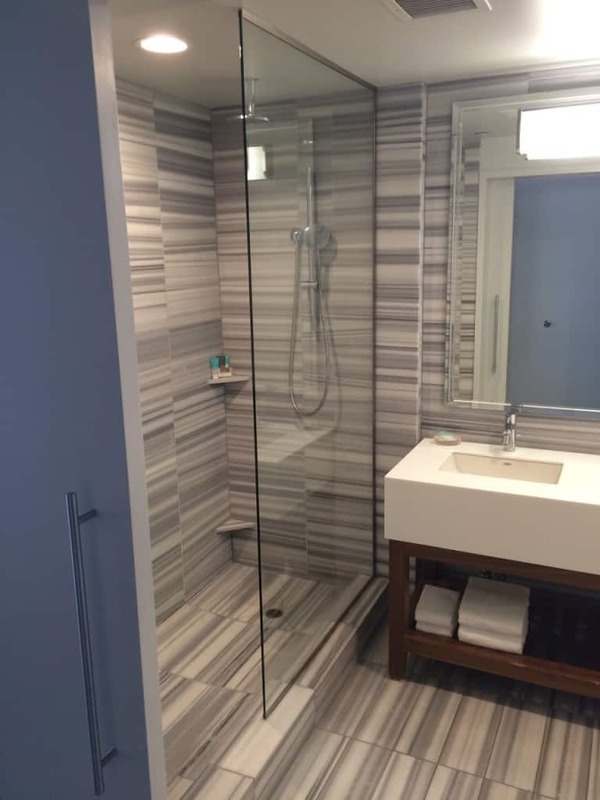 The walls and floor are stripped marble that flows out into the entry of the room. Single vanity but you have plenty of counter space. The door is a barn type slider with a small frosted window; not much privacy if you are there with others. The shower was fantastic. There was a small bench/stool that I imagine would come in handy for women wanting to shave their legs. Dual shower head; overhead rain shower and handheld shower head. No shower curtain or shower door, you just step in and out. It could make for a bit of a mess; I imagine water splashes out for most guests. A nice touch is that the shower controls are located towards the back of the shower so you can turn on the water without getting wet. I don’t know why more hotels don’t do this. All of the products (soap, shampoo, condition, body wash, lotion) was the standard KenetMD. No toothpaste but you could order it up by calling housekeeping if you so desired. 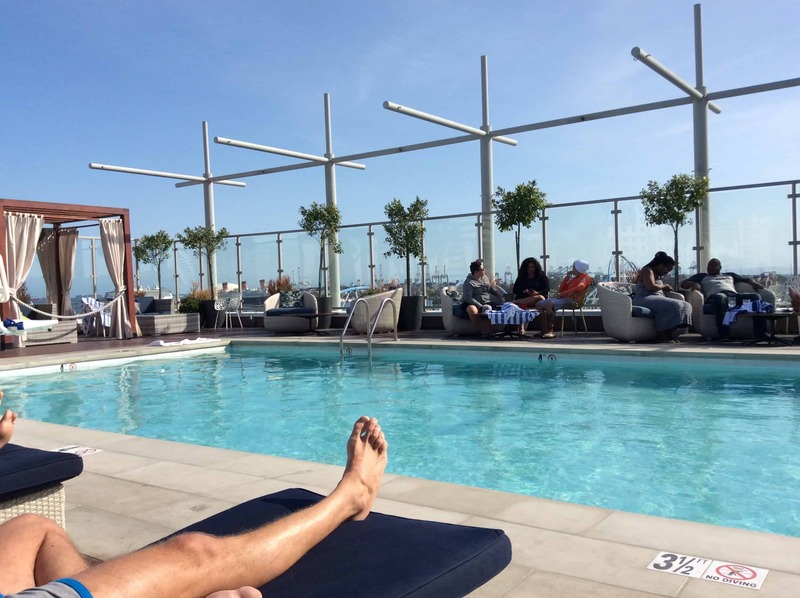 Pool: The pool is located on the roof (8th floor). The elevator opens directly onto the pool patio in the outdoors, a neat feature. There were a number of lounge chairs, two cabanas you could rent, and some table and chairs. A bar was located next to the elevators. I ordered a drink that was just okay. It looked like they had a basic food menu as well. In the elevator was a flier advertising that you could rent a cabana or table for the upcoming weekend race festivities. It seemed that Hyatt was trying to get locals interested in renting out cabanas. The day I visited the pool there was a group renting one of the cabanas that, I’m guessing, were locals. They were quite drunk and playing loud music on speakers they had brought with them. Maybe I am getting old, but it felt like a sad version of a Vegas pool club. The pool itself was warm which was nice because it was very windy on the roof. The pool deck had good views of the water and the Queen Mary. You could also see the Hyatt Regency which is surprisingly close. A nice place to spend an afternoon (minus the bad country music from the cabana guests). There was a gym on the first floor that looked like a standard hotel gym. No hot tub at this property. Service: The front desk was somewhat cold and business like; not very chit chatty. There was a security/doorman on duty part time (I am guessing mainly in the evening and overnight). I didn’t try out the hotel bar or restaurant, but they looked pretty basic (I am guessing Diamond guests would get breakfast in their room or at the restaurant). The bar staff was very friendly at the pool. I tested out the “Hyatt Has It”, ordering shaving cream and deodorant that was delivered to my room approximately two hours later. Not the fastest service. Parking: Parking is a flat $7 per day in The Pike parking garage. It couldn’t be more convenient, it is no more than 50 feet from the hotel entrance to the elevators for the garage. Bottom Line: Hyatt The Pike Long Beach is a nice, boutique-ish property. It will be much nicer once the construction all around the hotel is finished. 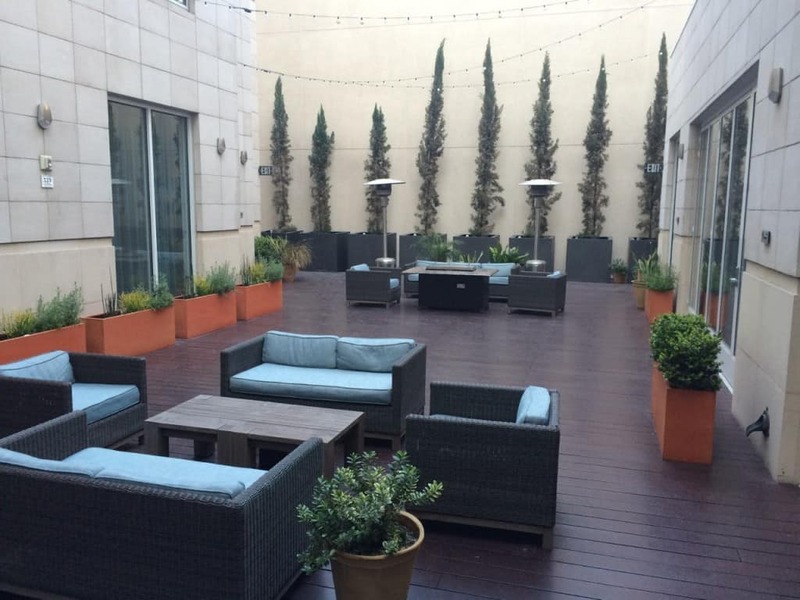 In the summer the roof and courtyard would be great places to hang out. It will be interesting to see if they make any changes to the property as it transitions to a Centric; hopefully it can more fully realize it’s identity and move away from trying to have a hip club vibe in the pool area. I didn’t go into the Regency (which is just down the street) but I am guessing this is a much more intimate property.